These leashes are custom made by hand using quality leather and hardware. 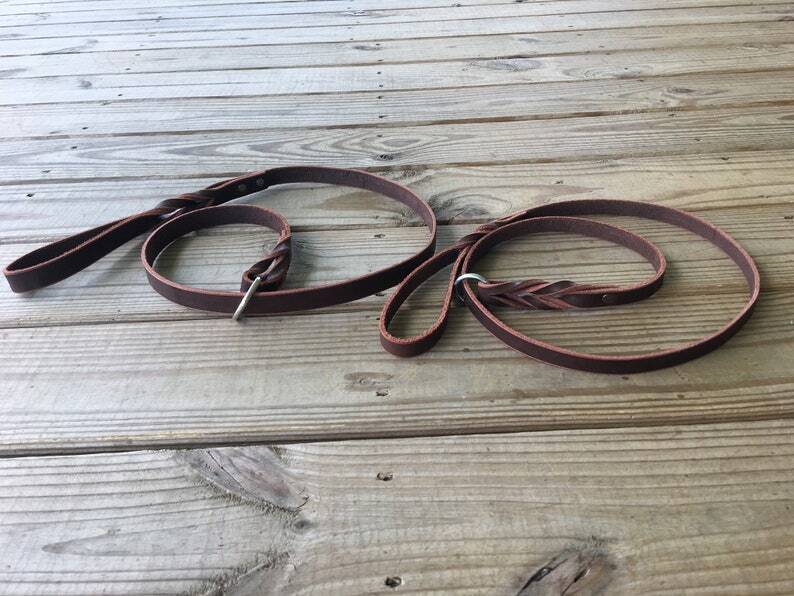 This listing is for 3/4" wide dark chestnut leather slip lead - leash. I use these leashes for rally and obedience training as well when I am running out for a quick walk. They slip easily on and off your dog's neck to make it quick and easy to put on and take off. A few years ago I started doing my own leather work for our own dogs. I realized the quality of the leather when purchasing from a store was not always the best or even leather sometimes. It was then when I decided I would start making my own with quality leather and hardware. Since, that time my collars and leashes have become very popular among dog lovers every where. When choosing the right width and length make sure it is appropriate for the size of your dog. If you are unsure of what one you need just contact me and I will help you. I do custom orders for collars and leashes. If you don't see what you are looking for do not hesitate to contact me. We want to make your dog the "Bark of the town"
The leash is very well made. I train dogs and needed a new leather slip leash and this one is perfect! As long as you take care of them and they aren’t chewed up or anything these leashes will lay a lifetime. There was a bit of an issue with the post office delivering my leash to the wrong address, the seller was really friendly and nice while figuring that all out. Even with the little mix up on USPS’s end it came really quickly. It’s not easy to find a good quality leather slip lead but I’m so happy with this- it’s perfect! Payments at time of purchase and can be made through Etsy Checkout or PayPal. I am certain you will get the collar/item your canine best friend deserves, so am open to exchanges/repairs. Due to the time and materials that I put in to each collar, I can not offer refunds. All of my items come with a guarantee. Any repair needed do to product failure will be repaired/replaced at no cost to you. This warranty covers defects in materials and craftsmanship only and does not cover normal wear and tear or damage caused by your dog. If any spots, studs, conchos, come loose or fall off, I am more than happy to fix/replace those at a very minimum cost. Leather Care : PLEASE NOTE that as with all leather products I do not suggest exposing it to water. If your dog does happen to go for a swim it is not a problem, just let it dry completely and always use leather conditioning products to protect the leather and keep it looking great. I want you to be satisfied with your purchase at my shop. If you are for any reason not satisfied, please contact me within 10 days of delivery the item. Neck Sizing - How to measure your dog for sizing. Measure around your dog's neck using a soft/cloth measuring tape. Position it where the collar will sit. The exact measurement is what you will need to know when purchasing or ordering a custom collar. Note: If you do not have a cloth tape measure, use a piece of string and then measure the string with a ruler. Did you find something in my shop, but it´s the wrong sizes/color? Contact me for custom orders, I love creating custom designs .